SiZerTM DNA Markers are ideal for determining sizes of double-stranded DNA fragments from 60 - 10,000 base pairs. The marker solution includes 7 to 15 linear double-stranded DNA fragments of known sizes which will yield distinct bands when loaded in agarose gel electrophoresis. This, then, can be used as molecular weight markers or a "ladder" of markers to compare with unknown fragments to determine their size. 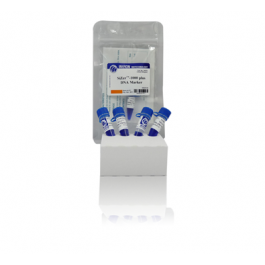 SiZerTM -1000 DNA Marker Solution includes 12 DNA fragments of sizes 250/ 500/ 750/ 1,000/ 1,500/ 2,000/ 3,000/ 4,000/ 5,000/ 6,000/ 8,000/ 10,000 base pairs. 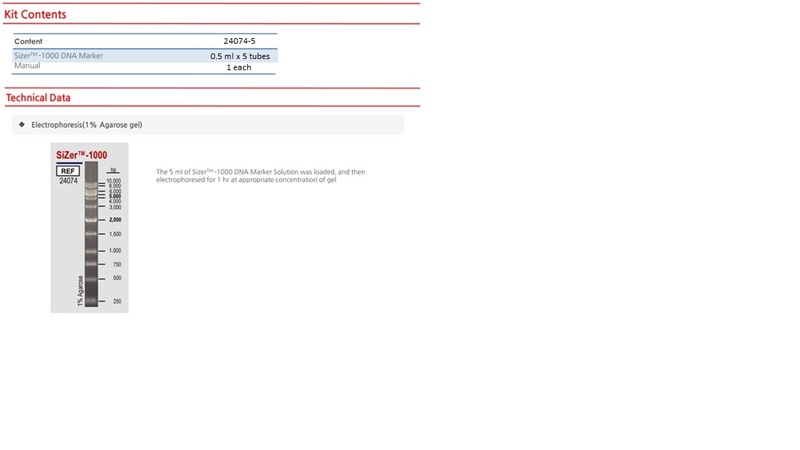 For 5μl loading, the fragments are 40 ng except representative fragments (bolded sizes above) which are 100ng. The representative fragments will yield bands of higher intensity to allow easier identification. All fragments have been precisely quantified during production and are pre-mixed with the loading dye, thus ready to use with no additional handling. 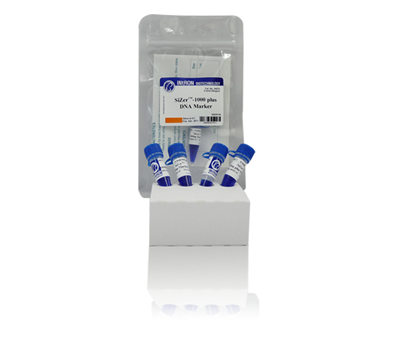 All SiZerTM DNA Markers can be used with RedSafe™ Nucleic Acid Staining Solution (Cat. No. 21141), Ethidium bromide (EtBr) or any other DNA stains.